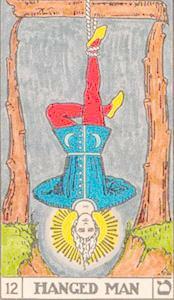 Synopsis: The Tarot images are derived from the astrological-formative symbolism of the Sepher Yetsira. The planetary correspondences were "encoded" to minimize the appearance of Jewish alphabetic influence and escape the ethnic-cleansing censors and religious psychopaths active at the time. 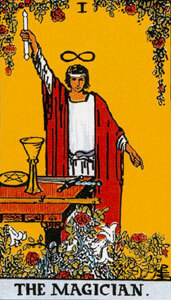 Later occult researchers mistook the finger for the moon and justified the inherited Tarot sequence. 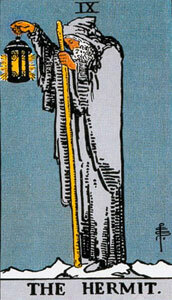 The Tarot wasn't meant to be understood by minds not ready to receive it. 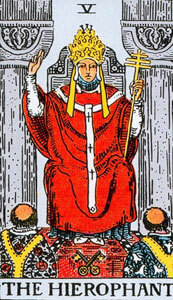 It invites views of the universe and kinds of thinking considered burn-at-the-stake-heretical when the Tarot appeared in circulation, and which will still result in excommunication or worse in certain denominations and cultures. 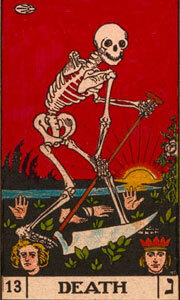 Even now, it is seen as "the devil's work" and associated with magic or paganism. And then we forget how much Europe in the early second millennium was not a place you would want to be, especially if you were a Jew (the Islamic world, the other principle habitat of the Diaspora, was generally more hospitable and appreciative). Jews in Europe had been subject to outbursts of "ethnic cleansing" beginning with the First Crusade. 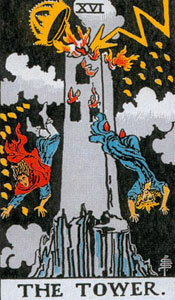 If we take seriously the historical context of violent religious repression (consider the Cathars) we can see why the Tarot might come with a child-proof cap. 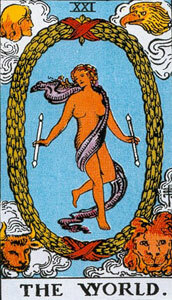 The images of the Tarot are derived from the inner meanings of the Hebrew alphabet as specified by the astrological, alpha-numeric and formative symbolism of the Sepher Yetsira. Each Major trump can be assigned to a Hebrew letter on the basis of the astrological or numerical/formative symbolism of the source text. 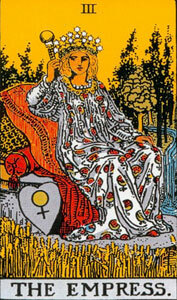 Nothing else is needed to establish a one-to-one correspondence between the two sets of twenty-two. 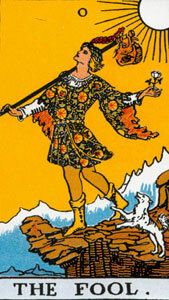 See Tarot Natural Order and Tarot Unlocked for summaries of the astrological-formative symbolism of the 22 Major Trumps. 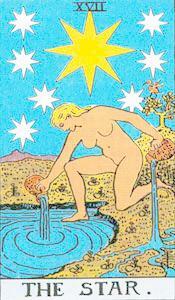 This means that the twenty-two letters of the Hebrew alphabet are the primary symbolic framework, not the Tarot. 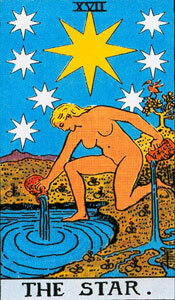 The images of the Tarot are derivative signs pointing to the cosmological signifiers of the "alphabet of creation." and are thus based in a Jewish tradition at least two thousand years old, and if we listen the the qabala, much older. 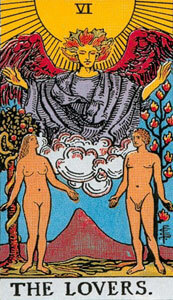 The tradition, in legend given by God to Abraham, later called "kabbalah", was always hidden deeply within an orally-transmitted esoteric Jewish heritage. 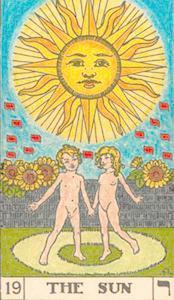 This tradition produced the Tarot in the late 14th or early 15th century, as a set of pictorial "flashcards" containing the basic symbolism of the Sepher Yetsira's astrological and formative letter correspondences for the Hebrew alphabet. 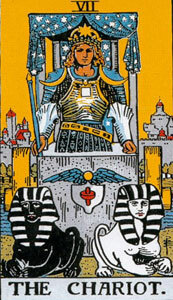 Nine trumps were shuffled in an obvious way to "lock" the keys and two clues were provided for their restoral. Unfortunately, the finger was mistaken for the Moon. 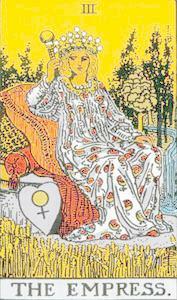 Before considering the deeper semiotic connections between the three systems of the Hebrew alphabet, astrology and the Tarot, and the reasons for aligning the Tarot rather than the alphabet, a little background on past approaches to the problematic of "attributions" may be useful for context. The idea of an "attribution" arises when the inner semiotic and semantic relationship (by which the "volcano erupts, see below") is not percieved, and a magical system of representation (lists of attributions) is used instead. 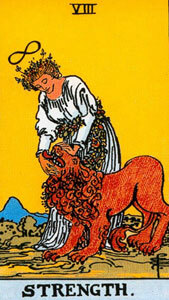 For those interested in the Tarot, the first problem is the traditional sources of interpretation, which almost without exception have come from outside the Kabbalah. 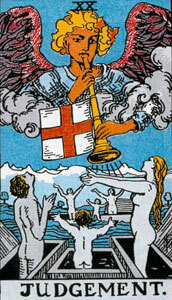 Nor have we reason to be pround of the fact that the greater part of the ideas and views which show a real insight into the world of Kabbalism, closed as it was to the rationalism prevailing in the Judaism of the nineteenth century, were expressed by Christian scholars of a mystical bent, such as the Englishman Arthur Edward Waite of our days and the German Franz Josef Molitor a century ago. It is a pity that the fine philosophical intuition and natural grasp of such students lost their edge becase they lacked all critical sense as to historical and philological data in this field, and therefore failed completely when they had to handle problems bearing on the facts. The natural and obvious result of the antagonism of the great Jewish Scholars was that, since the authorized guardians neglected this field, all manner of charlatans and dreamers came and treated it as their own property. 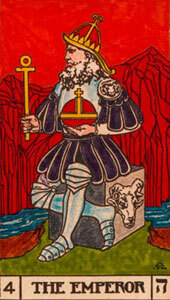 From the brilliant misunderstandings and misrepresentations of Alphonse Louis Constant, who won fame under the pseudonym Eliphas Levi, to the highly coloured humbug of Aleister Crowley and his followers, the most eccentric and fantastic statements have been produced purporting to be legitimate interpretations of Kabbalism. 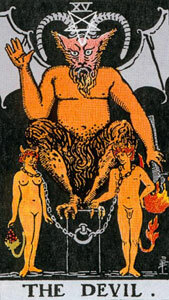 "To this category of supreme charlatanism belong the many and widely read books of Eliphas Levi (actually Alphonse Louis Constant; 1810-1875), Papus (Gerard Encausse; 1868-1916) and Frater Perdurabo (Aleister Crowley; 1875-1946), all of whom had an infinitessimal knowledge of the Kabbalah that did not prevent them from drawing on their imaginations instead." 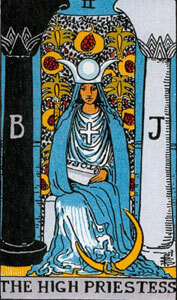 The second, and larger, problem is that the Tarot interpreters have rarely understood they were dealing with an alphabet and none the language formed from it. When a question is raised whether a scientific term is a sign or not, there will be no doubt that the word representing the term is one. Whatever a quasar or quark really is, the words "quasar" and "quark" are undoubtedly signs, created artificially to designate esoteric phenomena. But what happens if someone postulates that the enormous energy emitted from a quasar erupts from the word "quasar" itself? What if a scientific system arrives at the conclusion that the mountain emerges from the word "volcano"? In such a case, it will be possible to surmise that the word is the signified, while the material representation is the sign. This is actually the system presented by the Sepher Yetsira: The letter of the alphabet is the source of the planet, and not a sign by which it is designated. 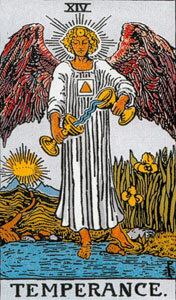 More than a hundred years of Tarot interpretation has been based on the idea that the planets (and the signs of the zodiac, which with the three elements are the manifestation of the twenty-two fundamental energies in the universe) are signs ("attributions") that can be moved around to fit various "occult" systems, without an understanding of why "the letter of the alphabet is the source of the planet." -- and is completely derivative of them. 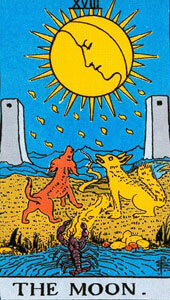 In traditional, French-English derived Tarot, seven trumps, all of those corresponding to the seven double letters in Hebrew and the seven planets in Yetziratic astrology are out-of-place with respect to their positions in the Hebrew alphabet and do not correspond to the astrological symbolism and Hebrew formative letters of any of the versions of the Sepher Yetsira, the Shiur Komah or classical (Ptolemaic) assignments. 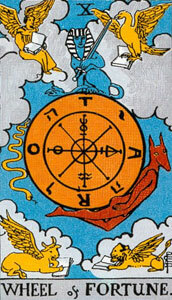 This is the famous Sepher Yezira, the Book of Creation, which was written by an unknown Jewish philosopher probably in the third century C.E., and became the most important work of Hebrew language and cosmology in the High Middle Ages, influencing centuries of scientists, philosophers, and mystics. 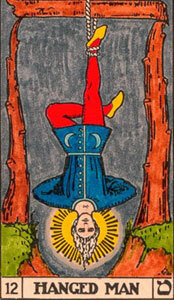 When the Tarot was circulated in the 13th or 14th centuries, nine trumps were shuffled as a means of "locking" the symbolic key to the inner meanings of the letters of the language of structure and energy. Only the most obvious of the "blinds," meant as a clue (the zodiacal swap of Strength/Leo and Justice/Libra) was removed by Nineteenth-century (French/English) "occult researchers," who were forced to abandon the source text for their own justifications of the positions of the seven planetary trumps that remained out-of-place in relationship to their Hebrew formative letters and astrological symbolism. The Jews were not consulted on this problem. 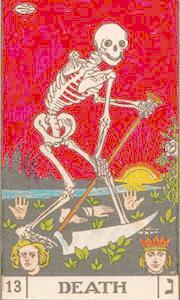 A century ago, there might have been some excuse for largely ignoring the ancient Hebrew tradition underlying the Tarot, given reasons of poor scholarship, obscure texts, preconceived notions and outright prejudice. 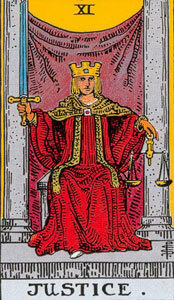 After the last fifty years of serious academic research in the area of Jewish mysticism and its relationship to similar Christian and Gnostic trends in late antiquity and the Middle Ages -- when the Tarot was created -- we no longer have that excuse. One would think a departure from standard usage would require more justification than a return to the sources.